Acting on a motion by Supervisors Mark Ridley-Thomas and Sheila Kuehl, the Los Angeles County Board of Supervisors voted unanimously to send a letter to the California Assembly and Senate, asking them to pass a resolution urging the Governor to declare a state of emergency in California, due to the pervasive and deepening homelessness crisis. In its request, the Board urged that the declaration include access to $500 million from the State Fund for Economic Uncertainties to implement statewide re-housing efforts, including street engagement, service triage, crisis housing, permanent housing navigation, rental subsidies and case management. 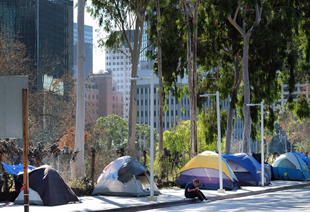 “The homelessness crisis endangers the health and safety of tens of thousands of residents, including veterans, women, children, LGBT youth, persons with disabilities and seniors,” Supervisor Ridley-Thomas said during the Board meeting. The declaration also requests that state agencies and personnel immediately deploy to help provide housing assistance to homeless camp hotspots in Los Angeles County and other heavily affected areas. The Board is also asking the state officials to identify and develop streams of ongoing funding for localities, so they can sustain successful efforts to combat homelessness. On any given night in Los Angeles County, there are nearly 47,000 homeless people, including 6,000 parents and their children. Nearly two-thirds live in the City of Los Angeles.